Samsung’s yet unofficial “Galaxy Mega” series of Android devices is set to debut with two smartphones in the beginning, namely the Galaxy Mega 5.8 and Galaxy Mega 6.3, and some more info on the latter is now available. Following leaked details on the specs list of Galaxy Mega 5.8, some info on the hardware of Galaxy Mega 6.3 (model number GT-i9200) emerged at SamMobile, showing that it will feature a 1.7GHz dual-core processor, paired with 1.5GB of RAM. Furthermore, the device is said to sport an 8-megapixel camera on the back and a 2MP front camera, to boast an HD resolution on its 6.3-inch screen, and to arrive on shelves in Black and White flavors. Wi-Fi, Bluetooth and GPS will also be included in the package, along with a 3200 mAh battery. 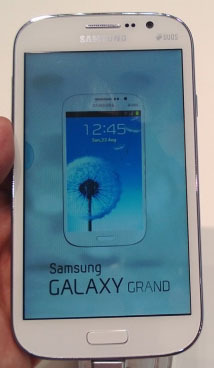 The smartphone is also said to measure 88 x 167.6 x 7.9mm, and run under Android 4.1.2 Jelly Bean right from the start. Apparently, while GT-i9200 will sport only 3G connectivity, a GT-i9205 flavor will also be released, with LTE capabilities inside.